Minimize your dog's shedding with a few simple techniques. 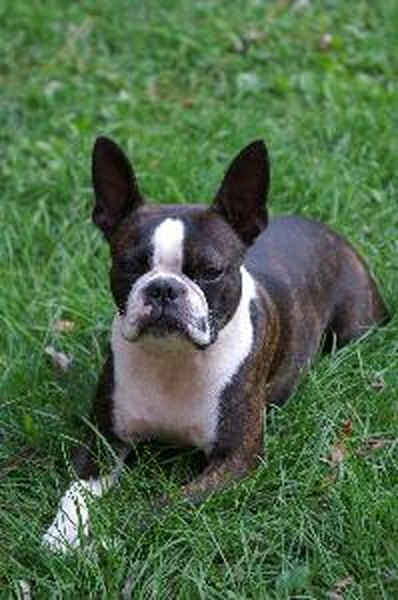 Boston terriers have short coats and they shed minimally -- they are a hypoallergenic breed. The Boston's shedding is natural; it's a process of removing dead hair. They shed mostly during the fall and spring. There are many ways you can help to minimize their shedding year-round. Feed your Boston terrier a well-balanced diet to reduce shedding. Give her high-quality dog food rich in protein, fat fibers and omega-3 or omega-6 fatty acids. Fatty oils are essential for a healthy coat, and they can control shedding. Give your Boston terrier plenty of fresh clean water to drink throughout the day: Hydration is an essential part of good skin and coat health. Brush your Boston terrier at least two times a week to help control shedding. Brushing will remove loose hair on your terrier and reduce the amount of it around your home. Look for and treat any fleas, ticks or other parasites you may see with an insecticidal shampoo to reduce scratching that may cause your pet to shed. Bathe your Boston terrier at least once a month to help minimize shedding. Apply a gentle dog shampoo and conditioner to her skin and coat, rinse, and then rub a damp towel over her body to remove any excess hair. Manage your Boston terrier’s stress level to help limit shedding. According to the University of Minnesota, excess stress can cause your dog to shed more than normal. There are many environmental changes -- such as moving, loss of a fellow pet or the addition of a new pet -- that can cause your dog added stress. Give your dog plenty of exercise, love, affection and attention to help manage her stress level and control shedding. Take your Boston terrier to the veterinarian for regular checkups to help minimize shedding. Vaccinations are available for many common diseases that cause shedding in Boston terriers and other dog breeds. If you begin to notice your Boston terrier is shedding excessively, take him to the veterinarian immediately for proper care. Your pet may have a medical condition that is causing the excess shedding. Boston Terrier Secrets: Do Boston Terriers Shed? Why Do Older Dogs Shed Big Clumps of Hair? "What Type of Dogs Have Hair, Not Fur?"